PIGEON FORGE, Tenn. (August 10, 2015) — Dolly Parton returned home, this past weekend, to help raise money for her Imagination Library and although the performances were billed Dolly: Pure & Simple, in simple Dolly fashion she shined brighter than the stars in the sky. The four sold-out shows, which took place at Dollywood’s D.P. Celebrity Theatre raised over $500,000.00. 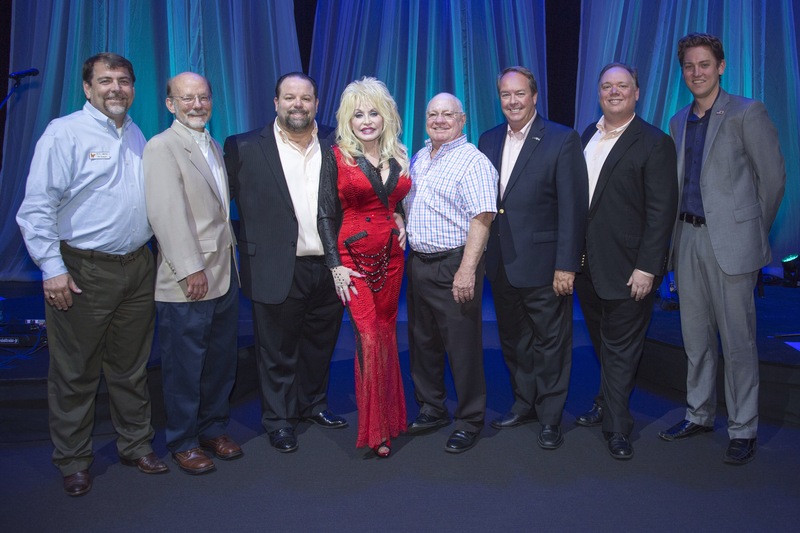 This entry was posted in Press Release and tagged $500000, CTK Management's Danny Nozell, Dolly Parton, Dolly Parton Productions President Ted Miller, Dolly Parton's Imagination Library Pictured L-R: Dollywood Dir. Public Relations Pete Owens, Dollywood, Dollywood Foundation President David Dotson, Imagination Library, Pigeon Forge, Pure and Simple Concerts, Tennessee, The Dollywood Company President Craig Ross, Webster PR's Kirt Webster and Jeremy Westby by dollyfan. Bookmark the permalink. Dolly’s Imagination Library is such an excellent project! Getting kids to read early will make a huge positive impact on their lives. Thank you, Dolly, for doing this! And congratulations on a successful fundraiser. That’s amazing! I really wish I was able to go!